Since Carlos Boozer was signed by Chicago as a free agent in 2010, statistically one of the most successful free agent acquisitions in franchise history, the Bulls were just one of four NBA teams to win at least 200 games. The others were the Spurs and Heat, who won three of the four championships, and the Thunder, who went to one Finals. Since Boozer signed with the Bulls in the summer of 2010, he started more games than any other Bulls player, he averaged more points than anyone other than Derrick Rose, who played in just two of those four seasons, and Boozer had more rebounds than everyone but Joakim Noah. He was also tied with Noah for the top shooting percentage at 49 percent. Boozer was second to Noah in most free throws made in that four-year period and averaged almost five minutes fewer per game than Noah. Noah was a star passing center averaging 3.7 assists the last four seasons. But Boozer averaged more than two assists per game. The Bulls Tuesday announced they had exercised the amnesty provision to release Boozer from his contract. He will be in a waiver period where teams can make bids for him with the highest dollar amount winning. Then that money would reduce the $16.8 million the Bulls owe Boozer for next season. Only teams with salary cap room can make bids. If none do, only then would Boozer become a free agent and be able to sign where he chooses. The Bulls won two thirds of their games during Boozer’s four-year tenure with the team. But in leaving the Bulls after four seasons, Boozer deserves praise for the job he did and perhaps a bit of an apology from some amongst a critical group who often have decried his play. All Boozer did was what he was asked. And perhaps even more. Questioned about health and stamina issues when he was with the Utah Jazz, Boozer was the Bulls iron man for four seasons with a training camp injury in 2010 the only time he missed more than a few games. Boozer remained a supportive team player even amidst his disappointment of often not finishing games by giving way to a better defensive player, Taj Gibson. Boozer rarely complained and never was an internal distraction when many former All-Stars, as he was, might have handled it differently. Boozer wasn’t the big game go to scorer the Bulls hoped to acquire in the 2010 free agency. But he never said he was. The Bulls record likely wouldn’t have been any different if they’d acquired either of the other two big free agent forwards that summer, Chris Bosh and David Lee. Boozer perhaps suffered the most, as he did in Utah, from not being Karl Malone. He was sold, even if it wasn’t his doing, as a low post 20/10 type big man even if he never quite matched that profile. He was a second round draft pick out of Duke in 2002 because he was an undersized power forward. Pros questioned whether he could adapt to the position in the NBA against the bigger players. But Boozer worked himself to the All-Star and USA Basketball level in an up tempo Western Conference running game and in Utah with the floor spaced with a three-point shooting big man like Mehmet Okur. But Boozer came to the Bulls under new coach Tom Thibodeau with a slower, more deliberate game crowded on the inside with big men who could not shoot as well and a driving Derrick Rose who didn’t have the three-point range of Boozer’s Utah teammate, Deron Williams. Instead of making excuses, Boozer pretty much did what he could, facing up and taking jump shots often. Chicago wasn’t expecting that sort of player, even if Bosh and Lee were as well. And Boozer suffered from the higher expectations of fans. Boozer never was known for his defense with the Jazz, the Cavs, in college or much of anywhere. But his lack of defensive quickness and what seemed a defensive desire often made him the target of fan and media derision for seemingly not being what they wanted. It looked like Boozer should have been a better defender. He just never was, and long before he joined the Bulls. Fans often tend to fall for the Dennis Rodman type who dives into the stands with a flair after the ball is out of bounds. 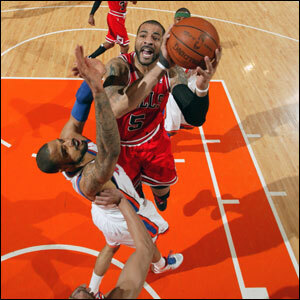 Boozer was the workman-like regular, showing up, doing what he could do, which was make jump shots and rebound. 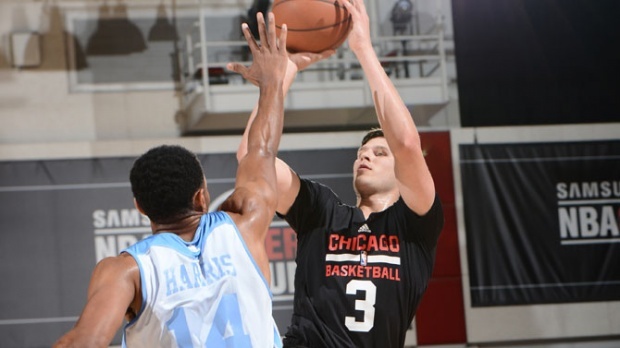 Averaging 15.5 points and nine rebounds in four Bulls seasons in just about 30 minutes per game is solid production. Boozer’s 20/10 averages with Utah were in seasons he averaged about 35 minutes per game and two or three more field goal attempts per game than he did with the Bulls. The Bulls had hopes that summer of 2010 of signing LeBron James and Dwyane Wade. It then became Boozer and a group of role players. And yet the Bulls, certainly in large part due to the extraordinary play of Derrick Rose, went on to lead the league in wins the next two seasons. Boozer wasn’t a big star, but he was a regular throughout as the Bulls made the conference finals in 2010 and seemed headed at least to that in 2011 before Rose was injured. But seemingly in the frustration of Rose being out and the team failing to advance very far in the playoffs, Boozer became a regular target of fan disdain. Certainly he wasn’t one of the top players in the league to match his extraordinary free agent salary. But why blame the player for a team’s largess? It will be interesting to see the value of some of this summer’s deals, like for Gordon Hayward, Chandler Parsons and Avery Bradley in the next few years. It’s a function of free agency and hardly the player’s fault for accepting a contract offered. Because you are paid an extraordinary amount of money in relation to other workers, do you then become automatically better? This season, obviously, was the most difficult for Boozer as he was frequently questioned by media about getting an amnesty after the season and booed even as the Bulls were losing at home in the playoffs. Boozer is a prideful man, and though he didn’t show it or cause any team disruption, it was hurtful. I suspect Boozer will be a much better player next season. I’d heard he’s contacted and worked this summer with some of the top big men who have played, including Karl Malone. With so much money available for free agents as players tend to mostly remain with their teams, it’s possible Boozer could earn another substantial contract next summer. It wouldn’t be a surprise to see him return next season in good shape and having a productive season. Though it is what the Bulls had to do. Timing is vital in most every endeavor and certainly in sports. It was time that Taj Gibson’s apprenticeship learning behind Boozer–and Gibson wasn’t ready until into last season—came to an end. As it happens, it may not because of the Bulls’ free agent acquisition of Pau Gasol. Gibson may have to remain a sixth man reserve to open the season. But he’ll clearly be in a three-man partnership with Gasol and Joakim Noah for playing time with no one–and not even Noah–guaranteed a starting or finishing spot depending on how the season progresses. So it’s even more necessary that Boozer’s time with the Bulls come to an end. And even more so as the Bulls added yet another power forward, albeit of a different kind, in shooter Nikola Mirotic from Spain. In many respects, Boozer did become a reserve last season as Gibson played the entire fourth quarters of most games. To his credit, Boozer basically never made it an issue and appeared to count the success and continuity of the team ahead of his personal success. For that, the Bulls owe Boozer a debt even if it’s what he was supposed to do. Though not that many follow through in that way. The easy answer is you make so much money you should not complain. But no matter the employment, it’s rare to see any workplace where workers or executives do not complain or make it an issue when they are demoted. The Bulls won two thirds of their games during Boozer’s four-year tenure with the team. The playoff record of 17-22 with two first round eliminations, though one when Rose and Noah were injured after the Bulls led the league in wins, led to much community frustration that too often found Boozer as a target. Certainly, Boozer’s defensive play was lacking and he produced erratically in the playoffs, though he rarely was a go to option. There won’t be any weepy goodbyes for Boozer. But he has remained professional, played regularly in never missing a playoff game, was a supportive teammate, enthusiastic and encouraging even as fates turned against him, and continued to score in double digits and always average almost 10 rebounds. The Bulls could have done a lot worse than having Carlos Boozer for four years. And they have. In the ledger of Bulls free agency, Boozer lands in the success column. We wish him well.